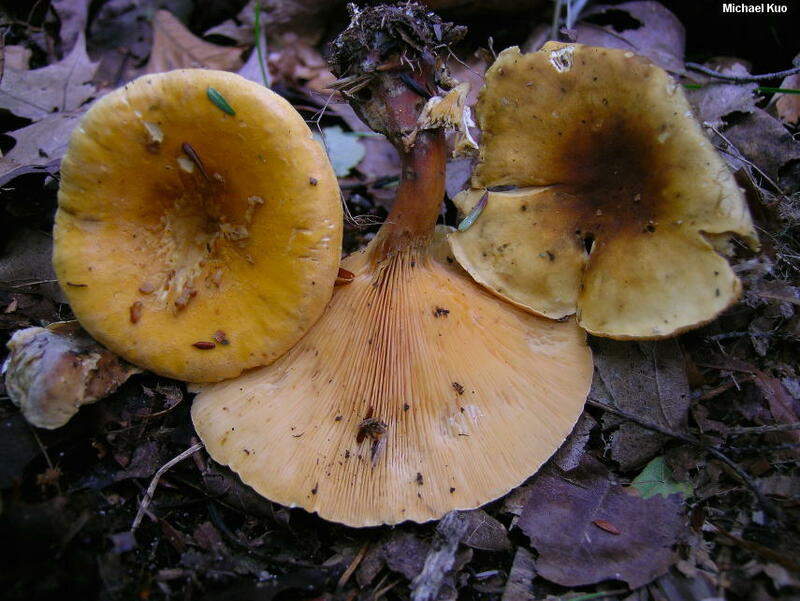 Hygrophoropsis aurantiaca bears a superficial resemblance to chanterelles (especially eastern North America's Cantharellus cinnabarinus), and is often given the label "false chanterelle" in field guides. 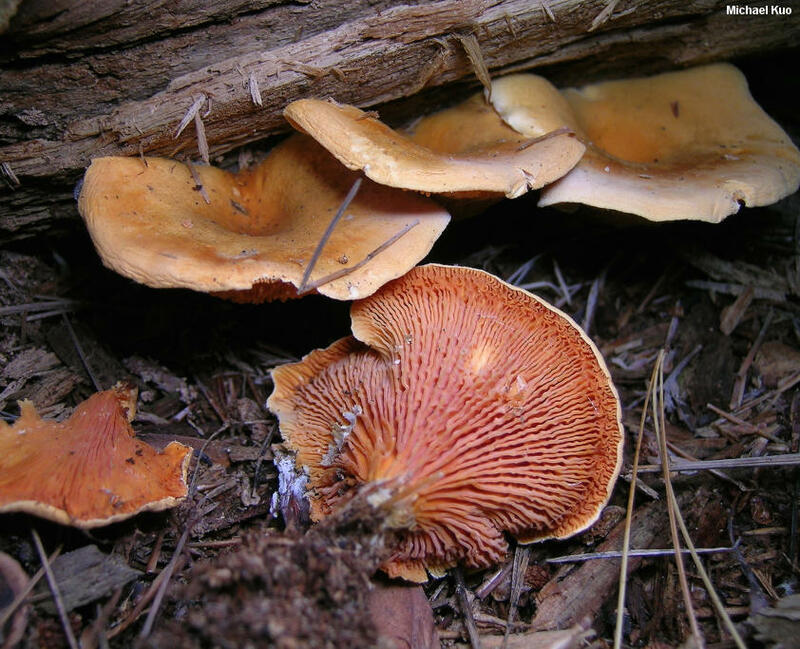 Unlike chanterelles, however, Hygrophoropsis aurantiaca features true gills, rather than false gills--and it is a soft, flimsy mushroom when compared to the hard-fleshed, sturdy chanterelles. 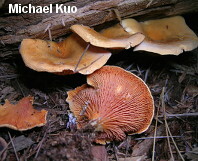 Defining features for Hygrophoropsis aurantiaca include the repeatedly forked, orange gills; the soft cap surface; the white spore print; and the dextrinoid spores. It is found on the ground, often near rotting wood, under conifers. Clitocybe aurantiaca and Cantharellus aurantiacus are former names. Ecology: Saprobic, decomposing forest litter and woody debris; usually found under conifers; occasionally growing from well rotted wood; alone, scattered, or gregarious; summer and fall (and over winter in warm climates); widely distributed in North America. The illustrated and described collections are from Michigan, Ohio, and Québec. 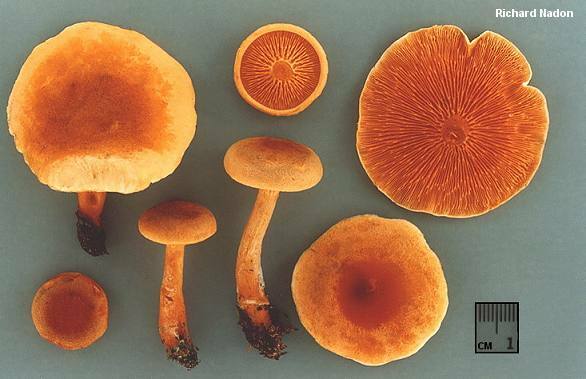 Cap: 4-8 cm across; convex, becoming broadly convex, flat, or shallowly depressed; dry; very finely velvety and soft to the touch; the margin initially inrolled; color variable, ranging from orange to brownish orange or, in age, brownish yellow; often with a browner center and an "oranger" margin. Gills: Running down the stem; close or crowded; repeatedly forked; pale to bright orange; soft. Stem: 2-5 cm long; up to 1 cm thick; often somewhat off-center; more or less equal, or somewhat swollen toward the base; colored like the cap, or paler; discoloring brownish; bald or very finely velvety; basal mycelium white and copious. Odor and Taste: Odor not distinctive, or somewhat fragrant. Taste not distinctive. Chemical Reactions: KOH on cap surface negative to reddish. 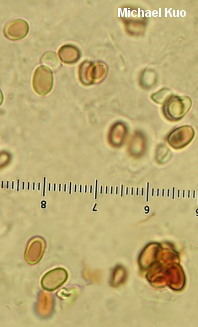 Microscopic Features: Spores 5-7 x 3-4 µ; ellipsoid; smooth; dextrinoid, or with both inamyloid and dextrinoid spores present. Hymenial cystidia absent. Pileipellis a densely tangled layer of clamped, cylindric hyphae 7-12 µ wide; terminal cells cylindric to subclavate. REFERENCES: (Wulfen, 1781) Maire, 1921. (Fries, 1821; Saccardo, 1887; Kauffman, 1918; Smith, 1975; Smith, Smith & Weber, 1979; Arora, 1986; States, 1990; Breitenbach & Kränzlin, 1991; Phillips, 1991/2005; Lincoff, 1992; Barron, 1999; Roody, 2003; McNeil, 2006; Miller & Miller, 2006; Trudell & Ammirati, 2009; Kuo & Methven, 2014.) Herb. Kuo 09120706, 10091001.